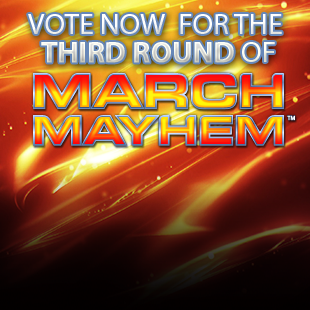 Voting for Round 3 of March Mayhem 2014 has begun. Make sure to get in there to decide the finalists! Voting in round two of March Mayhem has come to an end. We are now down to our final four competitors for March Mayhem 2014. Your votes have brought us to where we are today, and your votes are going to carry us through to the finish. From the beginning you chose the developers that took part in the competition. Now you've narrowed down the field to four. The voting is coming to a head and this round picks the two final combatants. Out of the final four, two must proceed and two must fall to the wayside. Help us pick the winner of the third round of March Mayhem with your vote. Voting is open for round three, make sure to hop in there and choose who makes it to the finals. If you're still wondering who deserves your allegiance we recommend that you head on into our forums to discuss with your fellow voters. Two time March Mayhem winner, Valve, has steamrolled its way through the competition. They made short work of the late Irrational Games, not too tough considering that Valve is still in existence. From there they met and defeated BioWare, another former winner of March Mayhem. It may seem that Valve is setting itself up to win again but now they're meeting Telltale Games. Telltale Games has already defeated a former winner and they did that in the first round with Mojang. They then faced down Tim Schaeffer's Double Fine in the second round, which they won handily. Now, the creator of The Walking Dead and The Wolf Among Us, goes up against Valve. Can Telltale defeat another former winner of March Mayhem? Discuss Valve vs. Telltale Games in our forums! Lucas Pope, creator of the massively popular Papers, Please, has come from relative obscurity to take March Mayhem by storm. He's already defeated 4A Games and Galactic Cafe in the competition, but now he's facing some stiff competition in Firaxis. Firaxis has developed what many consider to be the game of 2012 in XCOM: Enemy Unknown and now they've made it all the way to the final four of March Mayhem. In the first round they met the powerhouse that is Nintendo, and defeated them. In the second round they went toe-to-toe with the creators of Saints Row Volition, who they trounced. They're now facing the one man team of Lucas Pope to try and make it to the finals. Discuss Lucas Pope vs. Firaxis in our forums!